All 14 character classes in Nilly's Realm share the same eight stats, which can all be improved by reaching level 20 and drinking Stat Potions. Different classes start with different stat allocations, and gain stats at different rates with each new level. Furthermore, stats are capped at different amounts depending on class. Nilly's Realm does not differ from Deca's game with regard to the above. Thus, for more information about stat allocations, gains, and maximums, see this page on Realmeye. Hit Points (HP): The current and maximum health of the character. If damage is taken, this number decreases. It regenerates at a set rate (determined by Vitality, see below). If current HP sinks below zero, the character is dead. Mana Points (MP): The current and maximum mana of the character. 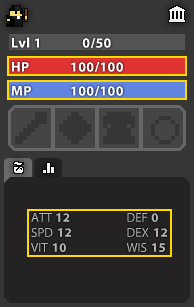 Mana is used when activating the character's class ability. It regenerates at a set rate (determined by Wisdom, see below). Mana does not sink below zero during normal play. Attack (ATT): Increases weapon damage by 2% per point, starting at half (50%) of listed weapon damage. Investment in Attack will raise weapon damage to 100% at 25 ATT, and 200% at 75 ATT. Defense (DEF): Decreases the amount of damage taken by 1 per point. However, 25% of a projectile's damage will always be dealt, due to a 75% damage-reduction cap. Note that in Deca's game, the damage reduction cap is 85%. Speed (SPD): Increases movement speed by about 0.07467 tiles per second per point, above a base rate of 4 tiles per second. This increase is not negligible: a character moves twice as fast (about 8 tiles per second) at 54 Speed. Dexterity (DEX): Increases attack speed by about 0.0867 attacks per second per point,above a base rate of 1.5 attacks per second. This increase is not negligible: a character attacks four times as fast (about 6 attacks per second) at 52 Dexterity. Vitality (VIT): Increases HP recovery rate by about 0.12 HP per second per point, above a base rate of 4 HP per second. This is significantly higher than the base regeneration rate found in the standard game. Wisdom (WIS): Increases MP recovery rate by about 0.06 MP per second per point, above a base rate of 0.5 MP per second. Also boosts the effects of some Seals, Tomes, and Orbs by up to 150% of their base values (at 75 Wisdom). The Mathematics behind this boost are explained in equation 1 below. Luck: Unique to Nilly's Realm, Luck directly affects the drop rate of all items by a percentage. The higher the base drop rate of an item, the more Luck will boost its drop rate. If a player can kill 1 Godlands enemy every 10 seconds, then that player will have killed 360 enemies in an hour. We'll account for time spent unloading inventory by reducing this number to 300 enemies killed in an hour. With 0 Luck, the player can expect to obtain 21 stat potions in an hour. With 10 Luck, the player can expect to obtain at least 2 extra stat potions in the same hour. The mathematics behind Luck can be seen in equation 2 below.